Q: I am going to a glamorous party over the festive season and wanted to find an affordable sequin or glitter top that I can wear with a pair of trousers, have you seen any that might be suitable? 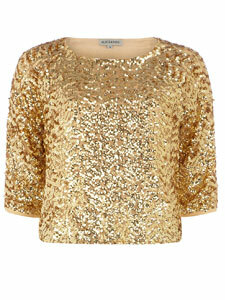 A: I really like this top by Alice & You, available from Dorothy Perkins. It’s in store now for £36 and should be perfect for your party and for other special occasions in the future. Merry Christmas.